When Minnesota’s hotter summer temperatures arrive, just the thought of a broken air conditioner is enough to make you lose your cool. But there’s no need to break a sweat. Your trustworthy HVAC contractors are here to help. At Krinkie’s Heating, Air Conditioning and Plumbing, we refuse to let the fear of a system glitch cause you to forfeit your peace of mind. Because of this, our team has honed our industry expertise to create the dependable HVAC maintenance service homeowners demand. So, from an AC unit check-up to thorough seasonal maintenance, our certified technicians will provide your system with the TLC it needs to heighten your air conditioner’s operating efficiency—and your home comfort—all season long. Your air conditioner is an investment worth protecting—and the first step is to retain your unit’s wellbeing. This means diving into the depths of your system to find and fix any parts that require a repair, replacement, cleaning or a little TLC. 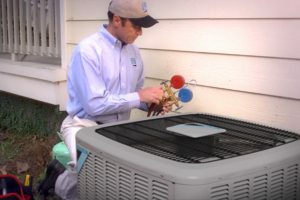 Doing so will minimize the potential for costly repairs, increase your unit’s operating and cost efficiency, and extend your air conditioner’s lifespan. Now who could pass up those benefits? It’s proven that the most reliable HVAC units are the ones that receive the best care. At Krinkie’s, our team delivers superior AC maintenance service for every air conditioner we service, every time. That means when you rely on us to inspect your system, you can guarantee we will clean, repair or replace your system’s parts flawlessly. If there’s a problem with your air conditioner, you can count on us to find it. It’s time to take back control of your home comfort from Mother Nature—and Krinkie’s AC maintenance services can help. The reason our technicians emphasize the importance of maintaining your unit’s wellbeing is because time and time again we’ve found that the more TLC a unit receives, the more reliably it performs. That’s why our HVAC company has made it easier—and more affordable—to keep up with your unit’s wellbeing through our maintenance agreements. Check them out here. Krinkie’s AC maintenance service clears the way for a sweat-free cooling season—literally. To experience the Krinkie’s difference, fill out our online form or call us at 651.488.5555 today! The budget-friendly way to protect your HVAC unit—and your home comfort. Contact Krinkie’s Heating & Air today. © 2019 Krinkie’s Heating & Air.